In honor of International Education Week (IEW) we are happy to announce the recent completion of the first Let Girls Learn Literacy and Learning Laboratory, with participants from 10 countries learning hands-on education strategies for teaching gender and literacy. As part of literacy initiative Read for Life, Peace Corps staff and Volunteers from Botswana, Burkina Faso, Cameroon, Kenya, Lesotho, Mozambique, Rwanda, South Africa, The Gambia and Uganda gathered in Masaka, Uganda, for the two-week workshop. One critical component of the training, Teach to LEAD (Leadership in Education for African Development), challenged participants to create educational materials from locally available resources and use their new teaching techniques in real-life classroom situations. Teachers broke into small groups to read books, plays and collections of poems by African authors, practicing how to analyze text to support language learners. Two of the featured Ugandan playwrights, Asiimwe Deborah and Adong Judith, stopped by with a key piece of advice for prospective writers. Both writers shared personal stories meant to inspire Lit Lab participants. 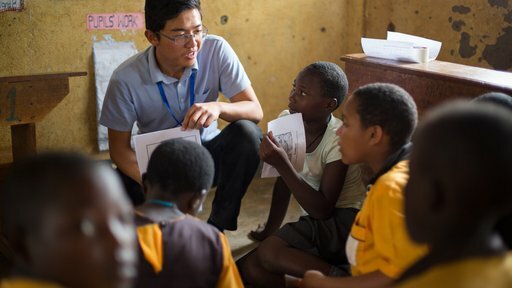 A defining moment in Asiimwe’s life came when her father encouraged her to publicly participate in a school program traditionally meant for men; for Adong, the spirit of volunteerism felt by Peace Corps Volunteers mirrored her own work in community education, including some work alongside the Peace Corps. She later leveraged her early volunteer experience to gain entrance into Temple University’s graduate school. Among other activities for Lit Lab participants: spelling bees in both English and local language Luganda (and training on how to host spelling bees at their own schools), Read Aloud sessions with young “teachers in the making” and phonics lessons. The U.S. Embassy in Uganda’s acting deputy chief of mission, Susan Parker-Burns, also attended some of the sessions to promote learning and literacy messages for African girls in celebration of International Literacy Day.